If the streets of Orange Farm could talk, it would tell of all the tears that had fallen on its red dirt: tears of hopelessness and poverty. Four years ago, Melinda du Toit embarked on a PhD study. She did not know how much she would come to care for the people that roam these streets. This week, Melinda became the second PhD-graduate from the Unemployment project. This project is a collaborative enterprise between the Katholieke Universiteit Leuven (KU Leuven) in Belgium and the North-West University’s (NWU’s) Optentia research focus area on the campus in Vanderbijlpark. She investigated the experiences of unemployment and looked for enabling and constraining contextual factors that influence the informal township entrepreneur. Melinda’s study provides an in-depth insight into the lived unemployment experiences of unemployed black people. It is the first time that this kind of research was conducted with people living in townships. The distinctive chapters provide a fascinating picture of the experiences of the daily life of an unemployed person. 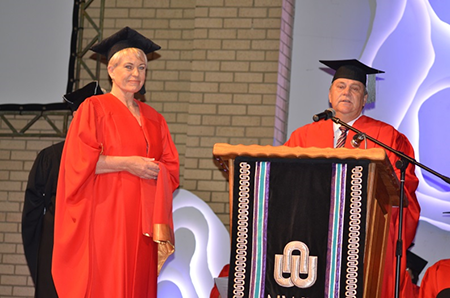 Melinda du Toit on her graduation day with her promoter, Prof Ian Rothmann. Melinda was one of three PhD students to take part in the project, which was funded by the Flemish Interuniversity Board. One of her counterparts, Leoni van der Vaart, graduated earlier this year, while the other, Rachele Paver, is in the final stretch of her study. The three students worked under the supervision of Prof Ian Rothmann, director of Optentia, co-promoter Prof Hans de Witte from KU Leuven, and assistant-promoter Prof Anja van den Broeck. Melinda is married to Hannes du Toit and the couple has a daughter, Anneke. For the past four years, Melinda has been a full-time doctoral candidate as part of the joint PhD programme between the NWU and KU Leuven in the research group Work, Organisational and Personnel Psychology. Two peer-reviewed articles have already been published from her thesis. Melinda returns to Orange Farm regularly. She is well-known and well-loved among the people who contributed to and took part in her study. The streets of Orange Farm still have a lot to say, but at least their plights have been given a voice. And with a voice, hope.